A couple weeks ago I decided to take a jump into the 21st century and upgrade to my first ever smartphone. The decision was strictly motivated by work - being able to receive emails on a handheld device would make it so I could spend time away from the office without the twang of overachiever's guilt that comes from being out of contact for sometimes five to seven hours at a time. Despite my new powerful toy, I still have no desire to have instant access to my precious facebook status updates and tweets and live-blogs 24/7. I agonized long and hard about which phone to buy. 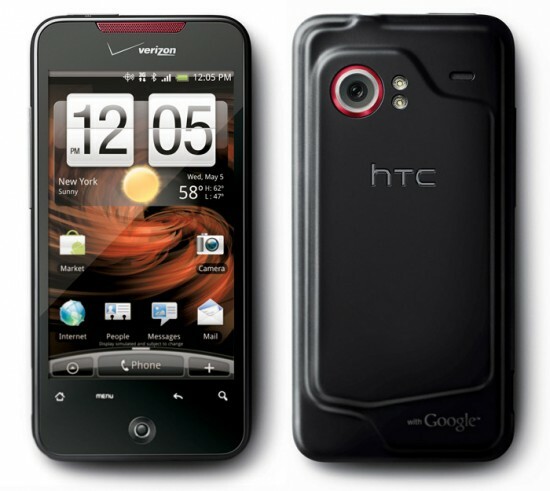 In the end, I decided to go with the Droid Incredible, manufactured by HTC exclusively for Verizon Wireless. For a while there I lusted after the iPhone, along with everyone else in America. I had fun playing with the ones owned by my friends and family, and part of me wanted to be part of a cultural phenomenon that has techies around the globe hanging on every software update or new announcement or breaking story. But I was already signed up with Verizon, and I didn't want to get involved with a business partnership that has caused so much stress to so many people in high places unless absolutely necessary. So now here I am, reading emails on the fly, texting on my full touchscreen, snapping pictures (and recording video) with my 8 megapixel camera, and downloading apps like there's no tomorrow. But has having a smartphone really changed my life that much? Is it worth it to have a device so limitlessly capable in the palm of my hand? Read on to find out what I really think. I must admit, when I first picked up this thing, I felt some acute iPhone envy. Although I never owned one, I was comfortable enough with the interface to see that this phone I had was new and different. And so I did the first thing that I normally do when confronted with something new and different: I panicked. But then what's up with these four icon buttons, right below the touchscreen: one shaped like a house, one that says "menu", one with an arrow facing left, and one that looks like a magnifying glass. There are just so many buttons.... Hasn't HTC learned anything about slickness and simplicity from their competition? I'm still not totally fluent, but once I got used to the new interface, I started to calm down a bit. I found that it was a little bit like picking up a Super Nintendo controller for the first time after a childhood of playing Sega Genesis. Everything's set up a little bit differently, but the functionality is generally the same. So much the same, in fact, that it prompted some legal drama earlier this year. Aside from the buttons, the main aesthetic difference between the iOS and the Android system that I've noticed is the arrangement of the home screen(s). On Android, apps show up much the same way as they do on the iPhone, but there's also the option of adding Widgets to your home screen. So where a standard app takes up one "block" of space, the Google search widget takes up four blocks - an entire row. 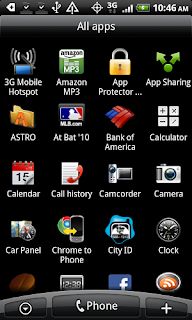 The weather/clock widget (pictured above) takes up eight blocks - a full half your screen. 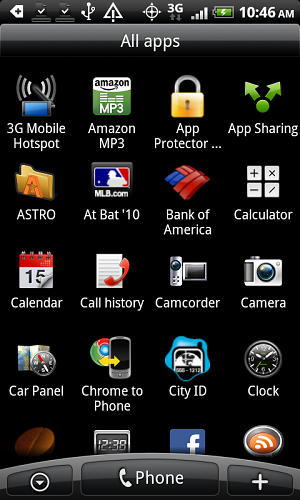 The calculator widget takes up 16 blocks - the entire size of your home screen. What's the point of these huge widgets? you might ask. With a calculator so large, there's no room for my messages, emails, or maps apps. That's why Android provides you with not one, but seven convenient home screens, each one fully customizable with apps and/or widgets. The selection of apps/widgets that already come with the phone is a little bit overwhelming - but thankfully you don't have to find a place on one of your home screens for all the apps you want to use. There's a menu where you can access all apps on your phone (including some duplicates, like when both Verizon and HTC offer separate apps for music, calendar, news, etc.). Looking at these cluttered menus, it again becomes clear that smoothness and user-friendliness do not appear to be at the top of Android's list. Apparently at the top of the list is Internet browsing, which the phone handles very well. What it doesn't seem to handle very well is email. The interface is fine: the auto-correct is very easy to navigate and there are less cutesy rounded edges than the iPhone interface. But I never get notifications for new emails - they don't even show up unless I open up the app and manually hit refresh. I don't know if that's a problem with my service or my mail client or the fact that any piece of technology I try to use doesn't ever seem to work the way it's supposed to. But it sure beats having to open up my laptop every time I want to check emails. The big home run has to be the ringtone editor. Honestly, the thing that made me most excited about having a smartphone, even more than emails, was being able to customize ringtones for all my most-used contacts. The Droid makes it really easy: just pick a song from your music app, hit the "menu" button, choose "set as ringtone" and you can trim it on the fly to whatever selection you want. For the iPhone I remember some complicated process of trimming it in iTunes and adding a loop feature and then uploading it. I hear there's a ringtone editor app that you can download for your iPhone that does what Droid's does. But then again I'm sure there's an app you can download for either system that can do pretty much anything you could ask it to (within reason). The possibilities are quite literally endless (as long as people keep developing new apps). I won't possibly come close to exploring even a miniscule fraction of these possibilities, nor would I want to. So far having access to these new features has changed my life, but I plan to resist having these capabilities take over my life.